Out of the six remaining major Republican candidates for President, only two remain that can claim “Executive Experience”; former Governor Jeb Bush of Florida and Governor John Kasich of Ohio. On Saturday, February 13th the two Governors squared off during the Republican debate, tackling questions around expanding Medicaid programs while maintaining conservative values. Jeb Bush has actively campaigned to repeal and replace the Affordable Care Act (Obamacare). However, there has been little discussion publically about what the replacement would look like. He also has publicly challenged John Kasich on his conservative record because Ohio actually used the Affordable Care Act to expand Medicaid to Ohioans that were making up to roughly $16,000/year. Jeb was instrumental in ensuring that Florida did not make that same decision. 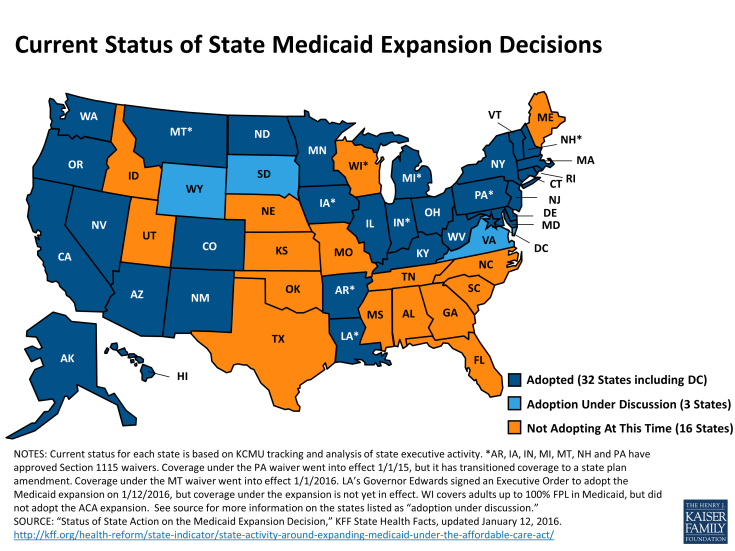 In fact, Florida joined 18 other states that have not expanded Medicaid since 2014. It was widely reported that Jeb met with Florida lawmakers back in 2013 and challenged them to come up with conservative alternatives to expanding Medicaid under the Affordable Care Act. One such alternative was a pilot program launched in 2005 that he dubbed “Empowered Care”. The program gave money to Medicaid recipients to buy their own healthcare plan from Health Insurance companies; while costs decreased, Florida still remained one of the states with the highest uninsured rates and in 2004, 25% of the uninsured were very poor. In fact, close to 50% of Florida’s uninsured workers earned less than $15,000 per year; the income level Obama’s Affordable Care Act was raised to Medicaid eligibility. So costs decreased, but less people had coverage. Kasich argues this is not conservative because uninsured Americans still need healthcare so the country ends up paying for them in more expensive places. Kasich decided to expand Medicaid under the Affordable Care Act in Ohio, along with 31 other states. Ohio now has 2.9M people enrolled in a Medicaid or Child Health Insurance Program, which is an increase of 623,626 since September of 2013. More importantly 90.2% of all eligible children now have health coverage. More enrollment means higher costs overall. However, uninsured rates fell from close to 14% to 10.5%. How does the Medicaid expansion work, anyways? The federal government partners with each state to offer the Medicaid program. In Ohio, the Federal government pays for roughly 63% of the costs and the Ohio state government covers the rest. However, when Kasich decided to expand Medicaid and more people with higher incomes could join the program, the Federal government took on 100% of the costs of the newly enrolled people. This will soon shrink to 90% in 2020, but it will still be a higher percentage than the 63% they pay now for Ohioans that were enrolled in Medicaid before the expansion. An Urban Institute study showed that with the Affordable Care Act and Medicaid Expansion, Ohio’s uninsured would shrink from 1.6M people to only 635k people by 2022. Another net effect is employers pay less for employee healthcare since they can opt for Medicaid benefits. The forecasted savings is close to $1.7 billion for Ohio employers. More importantly is the savings projected for the Ohio consumer. Kasich discussed the savings that happen when uninsured and underinsured people seek care through Medicaid and not through the emergency room without coverage. When people have insurance and seek care pro-actively as opposed to episodical, overall costs. Estimates of potential savings were as high as $7.4 billion by 2022. Kasich openly talks about how his state was facing a budget shortfall and now has a budget surplus of $2 billion. This would not have been possible without the confluence of many different state actions, including the expansion of Medicaid. Sometimes when Republicans defend Gov’t spending, it can be for conservative reasons. Mississippi: Why Not Try Bryantcare? ← 2016 Open Enrollment – 1 Week Left!